An established player makes a new, fresh play at the market. And we like it. If you’re anything like me, you’ve long regarded Capital One credit cards as strong in the cash back game, but not the best choice when it comes to incredible redemptions like Lufthansa First Class. That changed in a big way: In November, Capital One announced that it was introducing 12 airline partners to its program with a transfer rate of 2:1.5. While that sounds less than the 1:1 transfer ratios of Chase, Citi, and Amex, it’s not. The Capital One Spark Miles ( and Cash ) for business earn 2 points/cents for every dollar you purchase, meaning every single dollar your business spends on these cards will earn you 1.5 airline miles if you so choose to transfer. That’s pretty incredible. We heavily weight the appeal of credit cards in favor of their ability to access experiences and airline cabins that you wouldn’t ordinarily afford without points. Capital One has long been strong with Cash Back, but its new business and personal ( Venture ) products now afford you that ability. In fact, this is the first article we’ve ever written recommending you consider a Capital One credit card. For a limited time Capital One is offering up to a 200k welcome bonus for its Capital One Spark Miles for business credit card. Here are the details of the card. Spend $50k in the first 6 months and get another 150k bonus, totaling 200k total bonus miles. Earn 2x on all purchases with no limit. If you hit the $50k spend with The Capital One Spark Miles for Business credit card your account will have 300k miles in it, or 225k airline miles. That’s just ridiculous. There isn’t a card on the market right now with a public offer that will come anywhere close to earning you those kind of numbers. That’s 4.5 miles on any spend you make, non category bonus, just put your business spend on the card and earn baby earn. The ability to transfer into other programs equates to unlocking increased value in your points. For instance, Aeroplan is a partner, and you can redeem just 70k Aeroplan miles to fly Lufthansa First Class from the US to Europe. The welcome bonus alone is worth 3 one ways which Lufthansa charges nearly $10k a piece. In fact, Aeroplan, Air France, Avianca, Cathay Pacific, and Etihad are all programs we’ve written about in the past that facilitate the aspirational redemptions we want to achieve. Now they’re Capital One partners as well. Can you spot Miles in Lufthansa First Class on a 747-8i? An incredible redemption using Aeroplan for just 70k Miles. This is a business credit card. You may have a business and not realize it. Capital One is very friendly to entrepreneurs and small business owners. In fact, if you haven’t been in business for long, or you haven’t established yourself with an EIN, you can still apply as a Sole Proprietor ( fill in your SSN ). 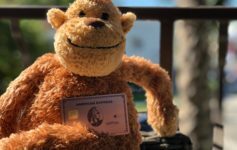 If you run a small side business (think bloggers, ebay sellers, tutors, consultants, etc) and want a card to segregate your business income from your personal income at tax time…this is a great opportunity to earn a load of points and help yourself out. Do Capital One Business credit cards affect my 5/24 number. Yes. If this is something that you’re worried about, then you should apply knowing full well that Capital One does report your small business credit on your personal credit report. Any other rules I should know? Yes, makes sure you read. Capital One will only process one credit card per 6 months…so if you’ve already applied for one in that time frame, you’re going to have to wait. This means both business and personal. My Business doesn’t spend $50k in 6 months. Keep reading. Are there expenses that your business pays that it isn’t putting on a credit card ? Like taxes, rent, club dues, educational services, etc? These expenses could be a way for your business to hit a minimum spend requirement and earn a large welcome bonus. Even though you’re paying an additional fee, the total cost of doing so could end up being far less than the value of the rewards you earn. Make sure you crunch the numbers and make a decision with the most information. If Cash back is more your thing…go for the Capital One Spark Cash for business – up to $2k in cash back. It’s a similar setup, but instead of points you’d be earning bonus cash with the following structure. Capital One has changed its presence significantly, and certainly picqued this blogger’s interest in their entire program. Transfer partners is a must these days, and Capital One has changed with the times. Having a welcome bonus that is absolutely monstrous is akin to when the Count of Monte Cristo threw a lavish party to announce his arrival on the scene. Who is that Count? He looks so familiar, but feels so fresh and new and attractive. I must put him in my wallet. Next Article Reminder: Amex Platinum cardholders use up your credits by 12/31!